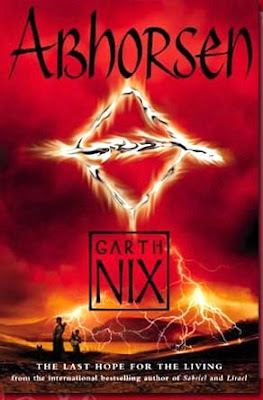 This book follows on almost seamlessly from Lirael as the two main characters Sameth and Lirael find themselves on the run from hordes of resurrected dead and powerful necromancers. Sameth has received news that his parents, the King and the Abhorsen are dead. Lirael is still looking for the place seen in the Clayr’s vision where she must meet her destiny and face the evil that is growing in the Kingdom. We find that there are more and more dead spirits being brought back from death and the necromancer that attacked Sameth has travelled to the wild and neglected western part of the kingdom in order to resurrect something that has been buried deep in the earth. At the same time, there is upheaval in the adjoining, non-magical country of Ancelstierre. Countries over the water from Ancelstierre (the equivalent of Britain and Europe during WW2) have gone to war and thousands of refugees are pouring into Ancelstierre. The countries equivalent of the National Front, the “Our Country Party”, have launched a campaign against these immigrants and are offering them land and homes if they cross the border into the Old Kingdom. As they cross the border the necromancer awaits them raising questions as to the origin of the war in the first place. I liked that as the story progresses we find more and more about the history of the Old Kingdom, the origins of the magic, or “charter” as it is known and the various people that inhabit the kingdom. Lirael’s origins are clarified as is Sameth’s real purpose. I also enjoyed the way many of Nix’s characters are drawn – the shouty old general ready to go down with his men, the army officer with the stiff upper lip, the mischief and banter of the Disreputable Dog and the white cat. I liked the way England is evoked in the creation of Ancelstierre. The action in the book careers forward and the tension builds and builds right up to the last moment. The ending of the series has all the struggle, sacrifice and final resolution that you can expect of fantasy series such as The Lord of the Rings or The Northern Lights. I did enjoy reading these books, Sabriel the most and Lirael and Abhorsen slightly less so, I would recommend them for anyone who enjoys fantasy books or wants to try something a little different.